Whatever your moving needs may be, Meathead Movers will help you feel at home in Oxnard. Our professionally trained student-athlete movers and our moving concierge will be with you for the entirety of your move to Oxnard. Whether you’re moving to Oxnard from across the country or simply from across town, Meathead Movers is the right choice for you. Our professionally trained, student athlete movers are clean-cut, dependable, and the perfect choice for moving your treasured household possessions. Our local Meatheads come from schools including Oxnard College, nearby California State University, Channel Islands, and California State University, Northridge’s satellite campus located in Oxnard. If you are looking for the ideal place to raise a family or run a local business, this is the place for you! Located 35 miles south of Santa Barbara and just 60 miles north of Los Angeles, this charming city is in a prime location for those who want the best of it all. With spectacular weather and sunshine present for more than 350 days out of the year, you have the perfect excuse to get out and enjoy the outdoors. Miles of gorgeous coastline and a laid-back relaxed atmosphere, make the city the perfect coastal getaway. It’s no wonder why people flock to this charming area. With a population exceeding 190,000, the word is getting out that Oxnard is a coastal paradise! Besides days at the beach, residents of Oxnard can also enjoy a wide array of recreational activities and events. You can take some time to roam the coast while pedaling your bike on the vast bike paths or go for a day of surfing or kayaking in the beautiful Pacific Ocean. Would you rather do something more relaxing? Enjoy some entertainment by the Elite Theater Company and stop by the Petit Playhouse or visit the Oxnard Independent Film Festival. If you are looking to learn more about the city, tour the Henry T. Oxnard Historical District and the Murphy Auto Museum for spectacular viewings of homes and cars from the early 1900s. The city is also famous for its fertile lands and is even known as California’s Strawberry Coast. You can taste some of the best strawberries at the California Strawberry Festival, or even grab a glass of strawberry champagne, one of Oxnard’s staple beverages. On top of delicious strawberry champagne, you can also check out Herzog Wine Cellars for a savory experience at the world’s largest producer of kosher wines. We know moving is stressful. If you are looking for peace of mind and a trustworthy moving company, you’ve come to the right place. 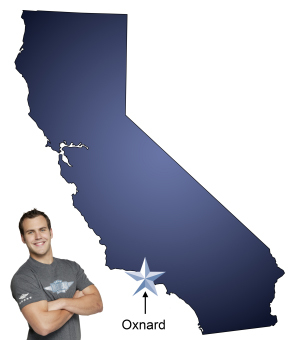 Meathead Movers specializes in local, long-distance, and commercial moves to, from, and within Oxnard. We also provide reliable packing, storage, on-site relocations, and our distinctive moving concierge service, which connects you with local service providers. All our student-athlete movers are thoroughly screened and trained before their first move. With branches not just in Oxnard, but all throughout California, we are your one-stop resource for all your moving needs, no matter where your California move takes you. With our 100% satisfaction guarantee, the only thing you have to lose is the stress that comes from moving! Contact us today for a free no-obligation moving quote and to learn how we can help you on your next move! Moving to Oxnard? Here are some helpful resources. Service was on time and very efficient. The two guys you sent were awesome. Very friendly and professional. On time, courteous, stuck to schedule, quick move and well done. Quick and easy. Movers were very professional and got the job done quickly. Movers were on-time, polite, and quick.